KHL.ru continues the introduction to the KHL All-Star Game teams. Today, the talk is about the Kharlamov Division, where you can meet the holder of the All-Star Game record for most participation. The Kharlamov Division features the biggest surprise of this season: Avtomobilist Yekaterinburg. The Ural team leads all the League for half of the season, and it’s not surprising that a third of the Kharlamov Division All-Star Game roster is made up of players from Avtomobilist. Interestingly, Avtomobilist players made the it to Kazan in any possible way, as they had players selected by the fans, the media, and the League. Stats rarely lie, and Jakub Kovar won 32 games of 38 this season with Avtomobilist. It’s the second KHL All-Star Game for Kovar, who participated in the first one a full four years ago. Since then, the Czech goalie also had a one-year trip to Severstal. Once he got back to Yekaterinburg, Kovar returned being the leader of the team as he was before. Vladislav Podyapolsky’s stock is rising this year. The 2018/2019 campaign is his first season where he has a full-time spot with Ak Bars, and he already played 27 games, more than other Kazan goalies (Emil Garipov and Alexander Sharychenkov). In spite of his young age, Podyapolsky has already four shutouts and is currently one of the League’s top goalies. The Ak Bars goalie is another great discovery of the 11th KHL season. The Ak Bars Canadian defenseman never played in Europe, but from the side, it looks like he’s a KHL veteran of many seasons. Postma quickly became one of the leaders for Ak Bars and is both scoring and contributing defensively for the team. He will certainly have a good opportunity to show himself on the best side as All-Star thanks to the support of his team’s fans. The towering Avtomobilist defenseman is at his second straight All-Star selection. He’s not a top scorer, nor the player with the best plus/minus, but no one in Avtomobilist has a bigger average time on ice. On top of that, Tryamkin successfully worked on his discipline and is accumulating less and fewer penalty minutes – he amassed only 25 PIMs so far. Antipin is among the best KHL defensemen for many years and is thus writing a new chapter of his family’s dynasty. It’s hard to believe that this is only the second All-Star Game for the Metallurg blueliner. Especially so if considering that his first time was in 2013. In that game, a young Antipin played on the third line in the match between Team Morozov and Team Kovalchuk and did not score any point. However, in the six next years, he managed to win the Gagarin Cup twice and three medals at the IIHF World Championship. Mozyakin is a real Russian hockey legend. He had enough achievements, but one is truly unique: he participated in each and all KHL All-Star Games! This is an incredible achievement, unparalleled in any other pro league. Moreover, almost every time Mozyakin was selected by fans’ choice and thus was often picked early. Only once had Mozyakin scored less than 40 points in a single campaign, and counting just the regular season, he wrote his name in the scoresheet more than 700 times. He, of course, has a full arsenal of KHL All-Star game records under his belt. Other than the sheer amount of games played, he is the top player in the points (34) and goals (24) rankings. To get a good sense, the second top goal scorer didn’t even reach ten! 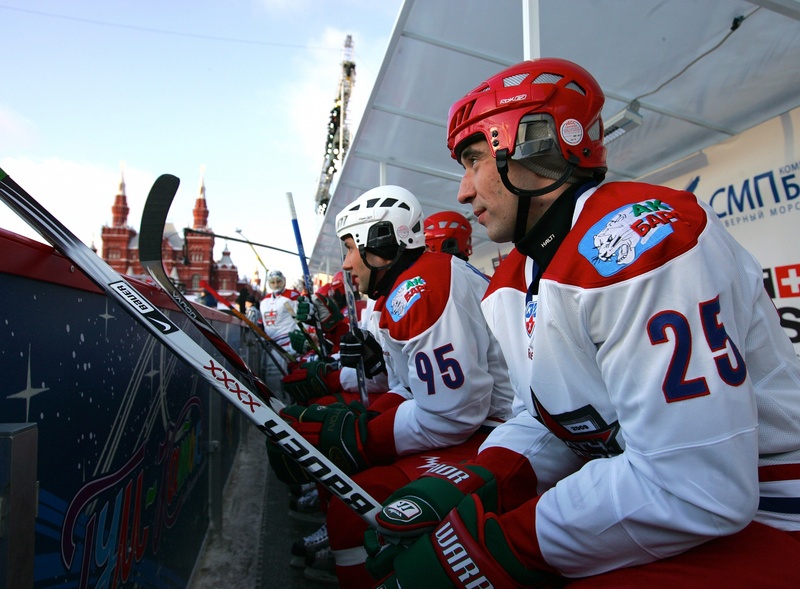 Zaripov is yet another KHL legend, a veteran who played at the first-ever All-Star Game on the Red Square in 2009. He had a three-year pause, as after the 2010 All-Star Game in Minsk he played in Bratislava in 2014, and one year later he captained the Eastern Conference in Sochi. He missed last year’s event in Astana, so this year the fans will enjoy yet another return of the Legend. In spite of his 37 years of age, Danis keep on playing a crucial role in the KHL reigning champions, Ak Bars Kazan. He is currently in the top three for his team in scoring with 26 (5+21) points and is the player with most assists. Among international players, Nigel Dawes is second only to his former teammate in Barys Kevin Dallman for KHL All-Star Games played. However, Dawes will play in Kazan his fifth All-Star Game in a row. All started in Sochi, back in 2015. Of course, last year in Astana he was one of the captains. It’s just the second All-Star Game for the Frenchman, but he played his first on envy of competitions. Da Costa is currently the second-best player in the KHL All-Star Game history for single-match points scored, with seven. It happened in 2016, in Moscow, when the current record for most goals was established. Western and Eastern All-Stars scored 51 times! After moving to Avtomobilist this summer, Da Costa hasn’t lost his touch. He has currently scored 40 (20+20) points, that is more than what he produced in his latest two seasons with CSKA combined! Moreover – and we’re disclosing you a secret – the All-Star Game in Kazan will be attended by a sizeable Delegation from France, who will be pleased to watch a big-time performance by one of the best players of their country. Finn players have a leading role in Neftekhimik, and their frontman, Juuso Puustinen at one point was the top player in the League for goals scored. He’s not on top anymore, but it’s hard to imagine where Neftekhimik will be without his 20 goals in 49 games, especially so if considering that they aren’t exactly a scoring machine. It will be exciting to discover how the swamp football world champion will fare in Kazan. And finally, one of the most interesting young players in the League: Vitaly Kravtsov. He acquired his star status on last year’s playoffs and today – being just 19 – he’s on the top three scorers for his team and is often compared to another prominent Chelyabinsk-native player, Evgeny Kuznetsov. Kravtsov is the 2019 KHL All-Star Game player (excluding the JHL participants), but he deserved the call with his strong game. It’s hard to believe that the most-winning coach in the League is taking part in the KHL All-Star Game only for the second time. Yes, you got it right, Zinetula Bilyaletdinov has more Gagarin Cup than All-Star Game appearances! However, he was merely obliged to play in front of his home crowd, and if we count the coach, the Kharlamov Division will have three Ak Bars representatives. Bilyaletdinov will coach Sergei Mozyakin and will be assisted by TV journalist Darya Mironova, who couldn’t help but declare: “Bilyaletdinov give the press so many catchphrases. One of them will become the trademark of our team at the All-Star Game: ‘We’ll get to your crease.’ However, it won’t be easy for the players: “The guys who worked with me last year will confirm: I am a very demanding coach. If players mess things up, they’re going to sit. I can even raise my voice if needed”. Mironova will have all the rights to act that way; she’s a very expert coach: she has as many All-Star Game appearances as Bilyaletdinov.